It is amazing what you can create when you dare to look beyond grass and rock. Every house is an original building or has been reproduced piece by piece with authentic historical accuracy. The restaurant was once a local dairy as you can see when you visit us. You can trust our food – we were there when the beef was born. Everything served is made with great pride, from scratch. We always prefer to use ingredients from our own farm or sometimes from our neigbours. Small and grand parties. We can provide you with great venues for up to 500 guests. In addition to our renowned quality candles, this vast outlet is stocked with attractive interior details, souvenirs, handcrafted wood, wool designs, fur and leather goods, stones, minerals, local arts & crafts, small scale providers of local preservatives, honey, spices and other delicacies. A wide selection of “Nisser”, snow globes, ornaments and pretty decoration pieces can be found in the attic all year around. couples looking for a romantic retreat. Arranging a party, team-building event or something fun and special? 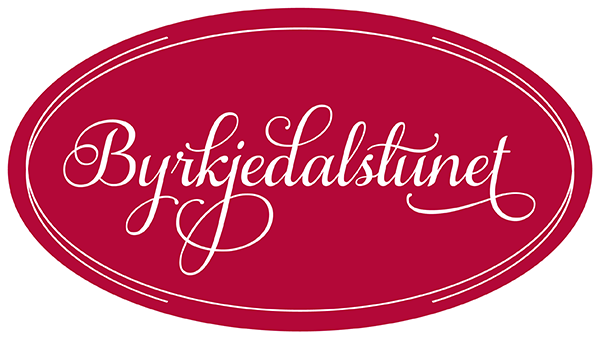 Did you know that Byrkjedalstunet offers great facilities for doing business? That Gloppehallen is magnificently carved out of the mountain to make the perfect space for something grand. That a charming collection of historical houses provides hotel rooms with comfortable beds and goose down covers. That the road has become a joy to travel and that Byrkjedalstunet is… so much more than you know. Saghuset has a grand meeting room with a terrace on the 1st floor and a large common room for socializing on the ground floor with the history of the house presented on the walls. Randalstølen is like a hunting lodge complete with an authentic wood-fired oven and sheep-skin clad long benches that seat 18. Bestastova and Bestyrerens kontor share a terrace. Jaktstova is a semi-secluded room a few steps down from the restaurant Ysteriet. Gloppehallen is truly a unique and majestic hall. It feels like an adventure to be invited into the heart of the mountain whether the occasion is celebration, launching a new product, a seminar or something completely different. The main hall is equipped with a stage, a system for lighting design and other high tech facilities. We pride ourselves in taking care of every detail. The food is made in our kitchen, from scratch, preferably using our own crop. We know all the details about each Hereford beef as the cattle has been born and raised at our own farm. Please stay the night! Our hotel consists of several small houses. Each room is fully equipped with TV, wireless network, tiled bathrooms and charming details. Are you looking for something exciting, planning a wedding or conference? Food, history and the true experience. Byrkjedalstunet is a hotel where the food, history and the earthy real experience are at the center. Byrkjedalstunet also has its own lighting fixture. Here are Norwegian-made and handmade candles together with a food hook and interior items and so much, much more. The sales room is about 1100 sq.m.